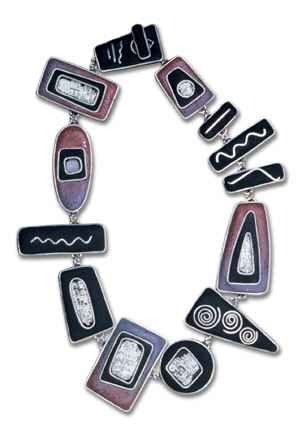 In 1996, Rio Grande in Albuquerque, New Mexico, introduced artists and jewelers in the United States to Precious Metal Clay (PMC) from Mitsubishi Materials Corp. in Tokyo. The material, a mixture of fine-grained metal powder with an organic binder, could be worked like clay, but became a solid piece of metal when kiln-fired. 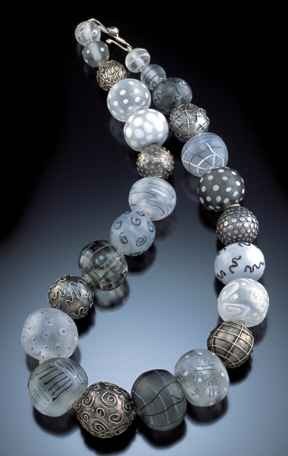 Polymer clay, fine and sterling silver necklace by Judy Kuskin. Six years later, metal clay hasn’t sparked a revolution yet. (The material is now referred to simply as “metal clay” because there are two competing varieties: PMC from Mitsubishi, and Art Clay from Aida Chemical Industries in Tokyo.) But it no longer belongs to the fringes of the jewelry world, either. Growing numbers of artists are discovering the material, and they are using it in innovative and increasingly sophisticated ways. Because the material is so unfamiliar to metalsmiths, much of the very early work seen in trade magazines and seminars had a tendency to be a little raw and unsophisticated. “For someone used to taking hours of labor to do the simplest things, [metal clay] was like, ‘wow, I can press my thumb into it and I’m done,'” says jewelry designer Jennifer Bowie of Salem, Massachusetts, a certified PMC instructor. As with any new material or technique, however, as more people began experimenting and bringing their unique backgrounds and sensibilities to it, the work being done blossomed in new and sometimes unexpected ways. “In the last year, I’ve sensed in the [metal clay] community a need to go beyond, ‘let’s just texture it,’ and now I’m seeing more untextured PMC, more three-dimensional forms, and more sophisticated and complex forms,” says Fago. Even those who don’t have a background in clay materials found it hard to resist experimenting with metal clay. Despite initial reluctance, Deborah E. Love Jemmott, a jeweler in San Marcos, California, became excited about the material when she began meeting with a group of jewelers who were exploring metal clay. “I resisted the material the way it was presented: I’ve been a jeweler for 25 years, and it just looked like a cutesy thing.” But seeing what others were doing with metal clay changed her mind. For example, another member’s presentation about how she molded a button in metal clay inspired Jemmott to try molding a piece of armadillo skin she’d saved for 20 years. That and other textures soon found their way into her jewelry designs, although she continues to use traditional jewelry techniques for much of her work. Jemmott’s initial reaction to the material wasn’t uncommon. At first, many metalsmiths were also put off by the way metal clay shrinks: The original PMC formulation shrinks approximately 30 percent during firing. Today, however, many artists opt for new formulations that offer shrinkage rates around 10 percent. They’ve also learned to integrate the shrinkage into their designs. Since its U.S. debut in 1996, Precious Metal Clay (PMC) has acquired several siblings-PMC+ and PMC3-and a competitor: Art Clay. Each of these is available in both fine silver and gold (22k for Art Clay, 24k for PMC). In response to concerns about the approximate 30 percent shrinkage of original PMC, Mitsubishi developed PMC+, which shrinks just 10 to 15 percent. This year, the company introduced PMC3, which fires at just 1,100 F/593 C to 1,290 F/699 C -compared to approximately 1,600 F/871 C to 1,650 F/899 C for other silver metal clays-allowing sterling silver and glass findings to be fired in place. It also offers a greater tensile strength than original PMC and shrinkage rates of 8 to 10 percent. Art Clay is also available in several forms. In addition to the standard clay form, it is sold in a “Slow Dry” formulation, which dries five times more slower than original Art Clay for a longer working time; in sheet form, for use in origami and other folding techniques; and as a paste-filled syringe, for the creation of detailed surface decorations, such as beadwork, faux granulation, and filigree. An oil-based paste is also available for making repairs and adding findings to pieces after the initial firing. There are a variety of educational resources available for users of both types of clay. For instruction in PMC, the PMC Guild Web site, pmcguild.com, offers a searchable database of classes throughout the United States. The Web site also includes information about the guild’s PMC Conference. Contact: PMC Guild, 417 W. Mountain Ave., Fort Collins, CO 80521. A calendar of Art Clay classes, including “crossover” classes for those already experienced with PMC, can be found on the Art Clay World Web site, Artclayworld.com, or by contacting Art Clay World at P.O. Box 607, Oak Lawn, IL 60454 ; 1-866-381-0100 or 1-708-857-8800. The International Society of Metal Clay Artisans. For more information, visit the group’s Web site at Ismca.org, or write them at P.O. Box 253, Antioch, IL 60002.